We are expanding and have moved our dental practice – all with a brand new look and a new name. We are now operating as VANCOUVER CITY CENTRE DENTAL. As of March 8, 2016 we are at 711 Richards Street – located in the new Telus Garden Building. We are operating a state of the art dental practice with all of the latest equipment. We are implementing a paperless software system similar to hospitals with digital x-rays that use less radiation. Our present staff will be joined by some new team members at the new location so we can extend our hours to include evenings and weekends to accommodate your busy schedule. We encourage you to tell all your friends and family about this exciting upgrade to our services and facilities. We are accepting new patients and would really appreciate your help in spreading the news. Our business, including website, email and telephones will be fully operational during the moving process and you will not experience any delays in service. Please update your records with our new contact information. 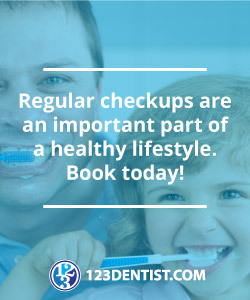 We are proud new members of the 123Dentist network which offers many special deals and will bring specialists into the office to provide care without having to travel to another office. We are looking forward to seeing you in our new location! At Vancouver City Centre Dental, we’re very proud and fortunate to be members of 123Dentist – Community Dentist Network.